ASCIA anaphylaxis e-training courses for schools and early childhood education/care was first launched in March 2010 (Version 1.0) to provide people with a training option where face to face training is not possible (or feasible), or as a refresher, or for interim training whilst waiting for face to face training. ASCIA anaphylaxis e-training for first aid (community) should be undertaken by the broader community such as parents, friends, carers or patients themselves; sporting clubs, playgroups and workplaces. 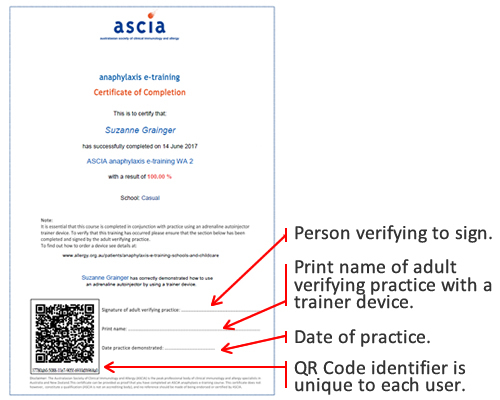 Any adult may sign the Certificate as long as they have seen you actually use the adrenaline autoinjector trainer device and have referred to the ASCIA Action Plan for Anaphylaxis available at www.allergy.org.au/anaphylaxis. ASCIA anaphylaxis e-training WA has been developed in December 2016. It is based on ASCIA anaphylaxis e-training for schools in August 2016 (Version 6.1). The course has been updated in July 2018 (Version 6.3) to include new generic versions of ASCIA Action Plans for Anaphylaxis. These plans have been developed for use with any brand of adrenaline (epinephrine) autoinjector available in Australia and New Zealand. The early childhood education/care version of the course has been approved by the Australian Children's Education and Care Quality Authority (ACECQA) for the purposes of the Education and Care Services National Law, and published in accordance with regulation 137(1)(e) of the Education and Care Services Regulations. Registration is on an individual basis. A username and password must be obtained from the e-training website registration process to participate in a course. Course participants should read each module carefully then complete the quiz. You must get each question correct before you can move onto the next module (feedback will be provided after answering each question correctly). Upon successful completion of the course (by achieving at least 80% in the final assessment module quiz) each participant will have access to a Certificate of Completion. The certificate is available as a PDF file for print or saving as required. Each certificate contains a unique QR code that verifies the participant and result. The course may be undertaken at the participant's own pace but it is recommended the modules are completed within a two week period.